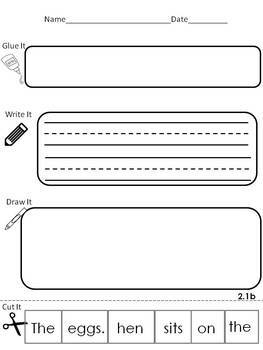 Read It Write It Glue It correlates with McGraw-Hill Wonders for First Grade. Students read, write, cut and glue, and illustrate a sentence that uses sight words and phonics skills covered in unit one. 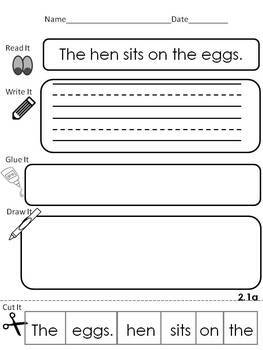 Use this product for morning work or literacy centers. 10 pages for each week of Unit 2, 50 pages in all. >One sentence for each day of the week. >Each sentence has two pages -- one with the sentence included for students to read and one without the sentence for above level readers to put in correct order without the prompt.